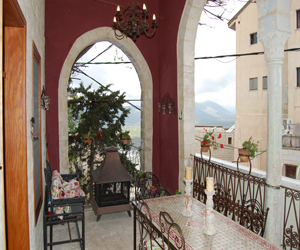 If you are looking for a very high standard bed and breakfast, the Beit Yosef selection of zimmers is for you. Scattered throughout the Artists Quarter and the Old City are 7 suites and one 3 bedroom house, which sleeps up to nine, all decorated and maintained to an extremely high standard. Visit the Beit Yosef Tsfat Hotel website for more information! All the rooms are individually furnished in an antique style, carefully chosen to complement the architecture of the buildings. With dome ceilings supported by exposed stone arches in many of the suites, these zimmers really enable you to feel the special nature of Safed. Everything is of the highest quality, and from the linens on the beds to the iron work on the imported Moroccan bedsteads themselves, you feel you are sleeping in luxury. The lighting is well planned and enables you to have the mood you want, whether it's for a romantic evening or so you can read in bed without disturbing your partner, you can set the lights accordingly. The suites are spacious and have everything you need, from dining room tables and chairs to comfortable sofas with plumped up cushions covered in designer fabrics. Some of the suites even have chaise-lounges where you can recline, as well as more conventional armchairs. The kitchens are fully equipped, having everything you need from knives and forks to weighing scales and recipe stand holders. Of course for Shabbat there is a water urn and hot plate so that you can keep Shabbat, if you so choose. The bathrooms have an elegant Edwardian feel to them with an old-fashioned English styled bathtub. There are of course modern shower fittings as well, so you can luxuriate in a deep bath, while perhaps reading a book and drinking a glass of wine, or take a quick shower and save water. All the zimmers are equipped with free internet and T.V so you will be able to stay connected to the outside world if you want. With air-conditioning as well as ceiling fans, you will be able to set the temperature as you choose. Even if you come in the middle of winter, the thick walls of the Arab-style rooms, together with the heating, will keep you nice and cozy inside. To enable you to keep your privacy, arrangements have been made so that you can enjoy an excellent full Israeli breakfast at the nearby Rimonim Inn, just a few minutes walk away. This breakfast with both a hot and cold buffet should be enough to please even the most fastidious of guests, not to mention keep you going until well into the afternoon, if not the evening! Rates per couple start from 750 shks with breakfast or 650 shks without, should you prefer to prepare your own. For each additional person, rates start at 100 shks without breakfast. It is even possible to book adjoining suites so that two families or groups of friends can holiday together while at the same time keep their privacy.